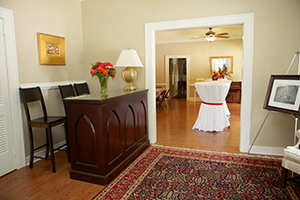 The Avondale Lake House is a special event venue that is picturesque, charming and affordable. Located just east of Atlanta, its proximity to the city (7 miles) and downtown Decatur (1 mile) add the convenience of being close to overnight accommodations, restaurants and shops and you will find it to be your ideal setting. It is a perfect setting for weddings, rehearsal dinners, receptions, reunions, banquets, parties and intimate family affairs. Since the 1920’s, the Lake House has been a landmark in the City of Avondale Estates, which is listed on the National Register of Historic Places. This Tudor style lakeside retreat easily accommodates 110 seated guests and 150 guests for cocktail and appetizer style parties. Renters have the option to choose their own vendors and caterers as well as provide their own alcohol and culinary creations at no extra charge. The Lake House is where you will find the freedom to make your special occasion memorable with a personal touch. A beautiful room to welcome your guests.This vintage venue features a beautifully decorated foyer perfect for welcoming your guests. The adjoining main room has a large wooden dance floor and seating area. An adjacent room, formerly a library, leads to the expansive covered porch where guests take in some fresh air, catch a cool breeze and enjoy a wonderful view of the well cared for Lake. In any season, it is a beautiful backdrop for any indoor or outdoor event. Nearby, a gazebo overlooking a gracefully arched footbridge is also available for a minimal charge. Additional amenities include a double-sided service bar, a commercial catering kitchen, and a ladies room with a bridal dressing area. From the main room, French doors open to a large outdoor patio where guests can dine, dance, eat and socialize. Renters are allowed the use existing tables and chairs arranged in advance at no extra charge. The renter must provide tableware, linens, and glasses. Onsite parking is also available at no extra charge.